This is the second part of Kayla Hamelin’s journal of her time working on the nesting beach with leatherbacks in Trinidad last spring. Kayla is the CSTN’s coordinator of conservation and educational outreach. You can read the first of her impressions of Trinidad here. Everyone is incredibly friendly and welcoming here. Our meals at the guesthouse are prepared by local women, and the food has an interesting blend of Indian, Caribbean, and other flavours that reflect Trinidad’s diverse cultural history. Plus the food is tasty and hearty—perfect for field-work appetites! We have bonded with the children who spend time at the guesthouse during the day. I am affectionately called “auntie” by one in particular. We play games, and “Angry Birds” on my iPhone is a popular request. Considering how different this place is from anywhere else I’ve lived or travelled, it’s surprisingly easy to settle in and feel at home. On our second night on the beach, we had a special task: training some of the Nature Seekers staff to deploy satellite tags. These are the same types of instruments that we have used to tag and follow Beverly, Asha and Christie. Instead of deploying them from our field boat and remotely following the turtles to the beach, we would like to do the opposite—have them deployed on a turtle here on the beach (ideally one with a history of coming up to the Canadian foraging grounds) so we can follow her in her post-nesting period. Learning how to satellite tag a nesting leatherback turtle. Turtle scientist, Mike James, and CSTN turtle technician, Devan Archibald, introduced the team to the equipment at the Nature Seekers office and then demonstrated how to set up the tag on an actual turtle that night on the beach. The training was successful and our tags are in good hands with the Nature Seekers. Now it is just a matter of waiting for the right turtle candidate: ideally a “CAN” turtle. The C-A-N code on a turtle’s flipper tags indicates she was tagged by us in Canadian waters. We might even find a turtle with a Canadian connection during this trip and be able to take part in the tag deployment! We have worked with a good number of turtles so far and have been happy with the progress of our work. We have also encountered an adorable possum by the edge of the forest; watched bioluminescent microbes flash their blue-ish light as we disturbed the mats of seaweed on the beach that harbour them; and taken a “snack break” to sip coconut water straight from the fruit. I can’t wait to see what the coming days (and nights!) have in store. Well, my prediction that Beverly would turn suddenly down to the nesting beach was wrong. She is still hanging off the Azores, and not heading to Trinidad. The reason I’d been so sure she might go to a beach there was because she had been recorded nesting in Trinidad before—and the last time was in 2013. Most leatherbacks in the western Atlantic nest every two to three years. The majority nests every two years (hence, my assumptions about Beverly). The time between nesting years is called the “remigration interval,” and it varies, sometimes by many years. Pacific leatherbacks, for example, have remigration intervals that are closer to four years. Scientists think the remigration interval reflects the amount of food a turtle finds on her migration. The interval is the time it takes the leatherback to eat enough to generate the energy required to migrate back to the breeding ground and reproduce. If Beverly does head back into Canadian waters, maybe we’ll find her again up here this summer. Most turtles are thousands of kilometers south of where we initially satellite tagged them by now. Christie is an excellent example of this. She is the classic post-foraging (feeding) season “Canadian” leatherback. Asha and Beverly, on the other hand, are a different story. These tracks are anomalous. Asha actually recently briefly popped back into Canadian waters! She’s just about 500 kilometres from where we tagged her at the start of August. 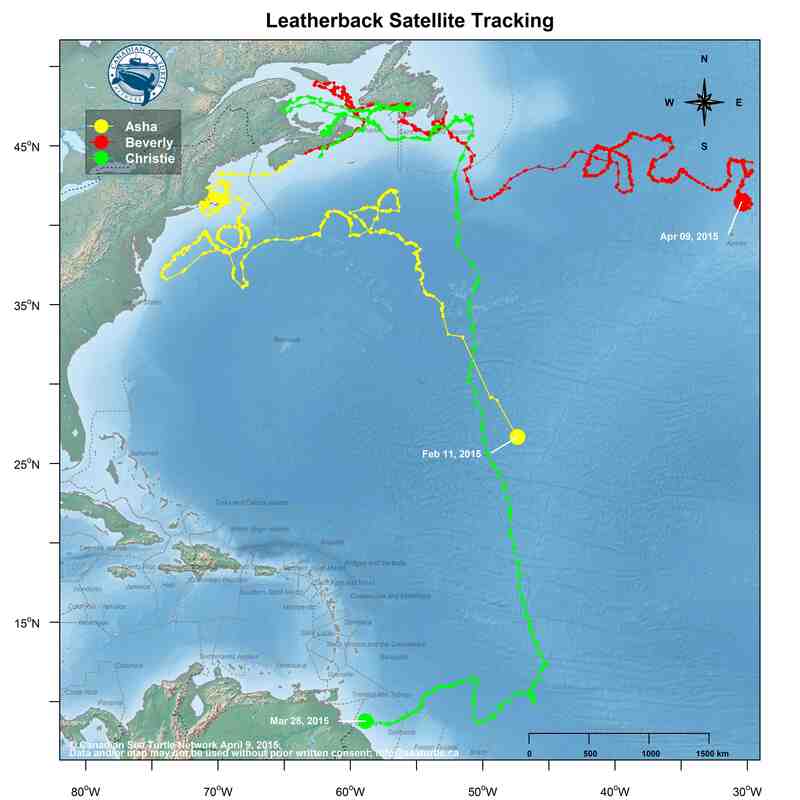 If you click here and also here, you will find the tracks of leatherback turtles that were satellite tagged on nesting beaches in South America and the Caribbean. Some of them travelled through the same area Beverly is in. I wish you could hear the precise note in Mike’s voice as he talked—a combination of “Hmm, why doesn’t this fit the pattern?” and the exciting, “Hey! This doesn’t fit the pattern!” crossed with a dose of extreme, infectious curiosity. One of the satellite tags (not the kind we follow online) used on loggerhead turtles tagged off Nova Scotia this summer fell off a turtle and was floating in the water. We wanted to get it back. It contains information that will be useful and if it’s in reasonable condition, it can be deployed again on another turtle. Finding a small piece of floating equipment in the ocean is a tall order. Fortunately, the tag was transmitting information about its approximate location (within a few kilometers). 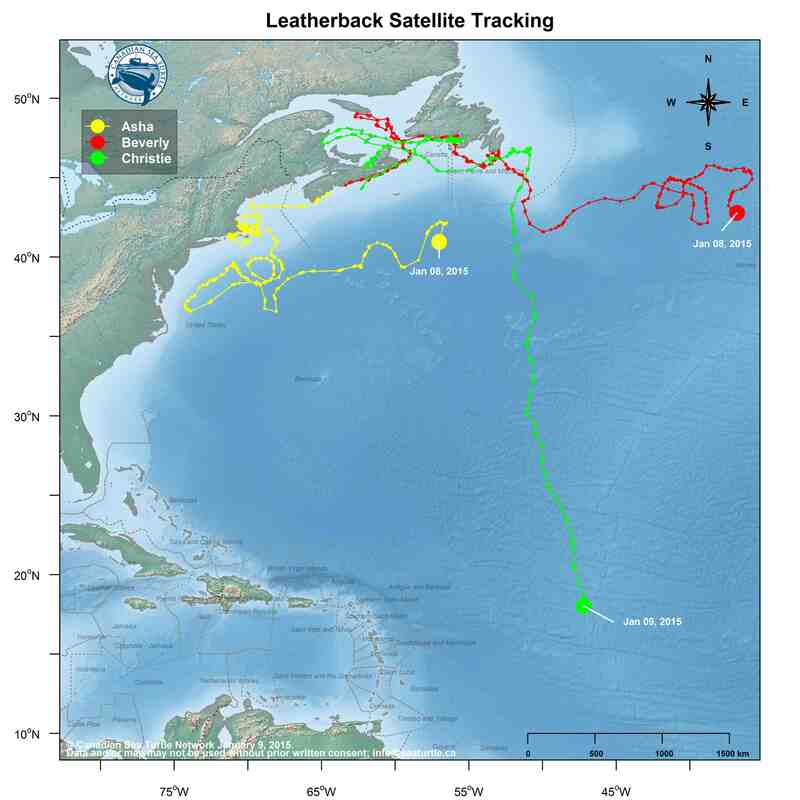 Canadian sea turtle scientist Mike James has been tracking the tag’s location as it drifted south from where it first came off a month ago at about the latitude of Rhode Island, USA. The battery was draining and he knew that the tag wouldn’t continue to transmit for much longer. He watched it as it meandered sometimes close to shore, sometimes kilometers off shore, most recently tossed in the currents in the approaches to Chesapeake Bay. And then, the tag washed ashore Tuesday night at False Cape State Park in Virginia! Thrilled, Mike called the park manager, Kyle Barbour. Kyle and his team at False Cape as well as volunteers from the Virginia Aquarium & Marine Science Center’s Stranding Response Program spent hours searching for the tag. False Cape is a remote wilderness park that preserves one of the last stretches of undeveloped American Atlantic coastline. The chief difficulty the search teams struggled with was the considerable amount of marine debris along the beach. They had to carefully comb through tangles of garbage and seaweed as they looked for the tag. 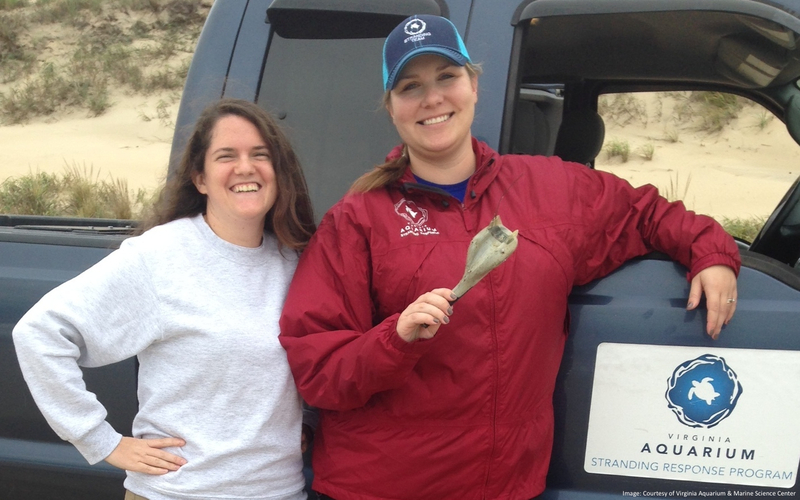 Virginia Aquarium Stranding Team intern Christina Lavin (left) and Stranding Team volunteer Kelly Bushnell holding the tag. Kelly was the person who ultimately found it! And just a few minutes ago, Sue Barco, senior scientist at the Aquarium, called me to say they had the tag! It takes a lot to make sea turtle science work. I’m always so excited and happy when people from different countries come together in these situations. So, this afternoon, our thanks to our new friends in Virginia from False Cape and the Aquarium—who dropped everything in their busy days to help us! We saw dozens of turtles last night. It was amazing. At one point I stood near the edge of the water in the darkness with three enormous leatherbacks emerging from the surf around me simultaneously. The white roiling water swept over the black masses of their bodies as they inched their way slowly up the beach. I was alone at that moment. Devan, Mike and Scott were walking further down the beach looking for turtles. I had to will myself to stand there in the starlight. Leatherbacks have been doing this for millions of years. Millions. It was something to be there, the wind off the water whipping loudly around me, watching. Being blessed by the primeval. We walked the beach for eight solid hours last night. We checked the flipper tags of every turtle we saw, but we found no Canadian leatherbacks.